New water play equipment at the Bridgeland’s Recreation Center in Cypress, Texas, is supported by Strongwell’s pultruded fiberglass. In the summer of 2007, the park was outfitted with a Multi-Play Climb & Slide from waterpark entertainment experts Aquatic Recreation Company. Aquatic Recreation selected a fiberglass platform from Strongwell because of the pultrusion leader’s ability to build rust-resistant, climbable structures for the waterpark industry. The 10’ square slide platform was designed using Strongwell’s EXTREN® series 525 structural shapes. DURAGRID® T-1800 1” pultruded grating with a non-skid surface was selected for the raised platform’s flooring and stair treads. A custom SAFRAIL™ fiberglass handrail system surrounded the platform and stairs. Matching fiberglass pickets were installed to prevent children from going underneath the platform. 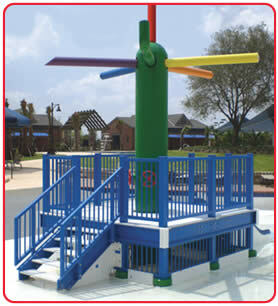 Unlike wood or metal structures, the fiberglass platform is well suited for a chlorine-rich waterpark environment. To insure UV protection, the fiberglass components were painted with blue and white polyurethane paint. The fiberglass slide will require minimal maintenance, resulting in a satisfied customer and a safe, solid structure for children’s water play activities.